It’s enticing when an album goes from soft and acoustic to sharp and electric. It’s even more enticing when it fits. 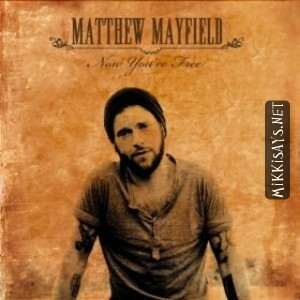 This is what singer/songwriter Matthew Mayfield does in his latest album Now You’re Free. And he does it with originality. “Come Back Home” and “A Cycle” are among the slow tracks on the album, which have a piercing quality that grabbed me by the shirt and forced me to listen. Mayfield’s delivery is raspy â€“ and at times even whiney â€“ but the songs are delivered with sincerity and a sense of yearning. In “Fire Escape”, his voice sounds so close and real that it was hard to believe he was not sitting next to me. The imagery he poses in the lyrics, “As you bite your bottom lip, can you feel my kisses on your hips?” added to the already-sensual tone of the song, pushing the resonance to an even deeper level of intimacy. The vocals convey the kind of pain that can only be born of experience. They carry an innocence that is reminiscent of a more mature sounding Carter Hulsey, an acoustic folk artist. And another thing: I haven’t heard so many good intros in one album in a very long time. Nearly every song had a hook that drew me in – whether it was a kick drum with bass, an acoustic riff or a simple electric pulse. Mayfield’s deftly played acoustic/electric guitarsâ€”doubled with the jagged and soulful vocals his fans have come to loveâ€”produced a personal and more confident sounding album.